How do UFOs travel in space? It's one of the most frequent questions asked when it comes to extra-terrestrial UFO's. How can they possibly travel the vast distances? Many debunkers will make inane jokes about it. ("Why would they travel trillions and trillions of miles only to not show themselves or simply leave?") The only answer can be is that it's simple for them to get here by means that man right now cannot fathom. The biggest problem for our space travel is the fact that our classical physics is flawed. According to black hole theories, nothing can survive in a black hole as it is crushed completely before reaching the point of singularity. But that is not how black holes actually work. The theoretical physics is misguiding us by constraining our thought process to the physical universe. The UFOs of the advanced alien civilization have mastered the contemporary physics throwing away classical old misguiding physics. The way UFOs travel through space and time is unique. They use something called Black hole-White hole combination to make travel through space easy, fast and comfortable. Black holes are really a rotating cluster of packed neutrons that produce a huge amount of centrifugal force to prevent formation of singularity. Traditional physics assumes that a black hole has a point of singularity in the core. This is not true. The UFOs tipped with exotic matter enter the Black hole, never get crushed but come out through a White hole. The tunnel connecting the Black hole and the White hole provides the easy and protected passage for the UFOs. In 1963, New Zealand mathematician Roy Kerr was first to provide light towards the real nature of Black holes. But conventional physicists decided to ignore him. The White hole is the reverse of a Black hole. In a White hole things are pushed out with the help of dark energy or anti gravity exotic matter. What is finest technical achievement of the UFOs is the ability to control the gravitational forces in a Black hole. They can also control the exotic energy pushing everything out through a White hole. A tunnel to a White hole opening up in the parallel universe connects every Black hole. 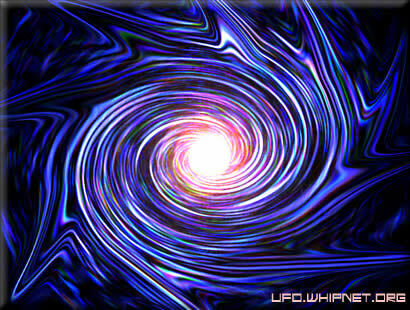 The UFOs use artificial wormholes and change their characteristics at the entry and exit. They create controlled Black hole at the entry and a controlled White hole at the exit. The UFOs first accelerate to the center of the tunnel using gravity of the Black hole characteristics and then use the controlled exotic matter phenomenon to get out of the tunnel through the White hole. Artificial wormholes simulating Black holes are needed for space travel and time travel within the physical universe. That is exactly what the alien civilizations use to travel instantaneously through time and space. In case one wants to travel to the parallel universe, the real and not simulated Black hole can be used. That may be the way our soul moves from physical universe to the parallel universe of higher dimension. That may be the reason why people with near death experiences see the white light at the end of the tunnel. They also report first acceleration and then deceleration and finally acceleration again to move out of the White hole to the parallel universe. As the 21st century unfolds, radically different forms of air and space vehicles will replace the clunky machines of today, whisking passengers at ultra-high speed around the Earth and outward into space. Laboratories scattered around the world are delving into novel and exotic forms of propulsion. Breakthrough physics could well make possible ambitious human treks across interstellar distances. Work is underway to harness antimatter as a way to shave travel time to the Moon down to minutes, or between Earth and Mars to a day. Meanwhile, laser and microwave technology is rapidly advancing the idea of beaming people and payloads effortlessly into Earth orbit, making fuel-guzzling rocketry look like the horse and buggy of yesteryear. Nearly 100 years after the epoch-making exploits of the Wright Brothers -- the first successful sustained powered flights in a heavier-than-air machine -- visionary scientists and engineers see "far-reaching" ways to turn solar system touring into a Sunday drive.